How Do You Succeed in Business? By Taking Classes in Literature, Music, Fine Arts, and International Issues! 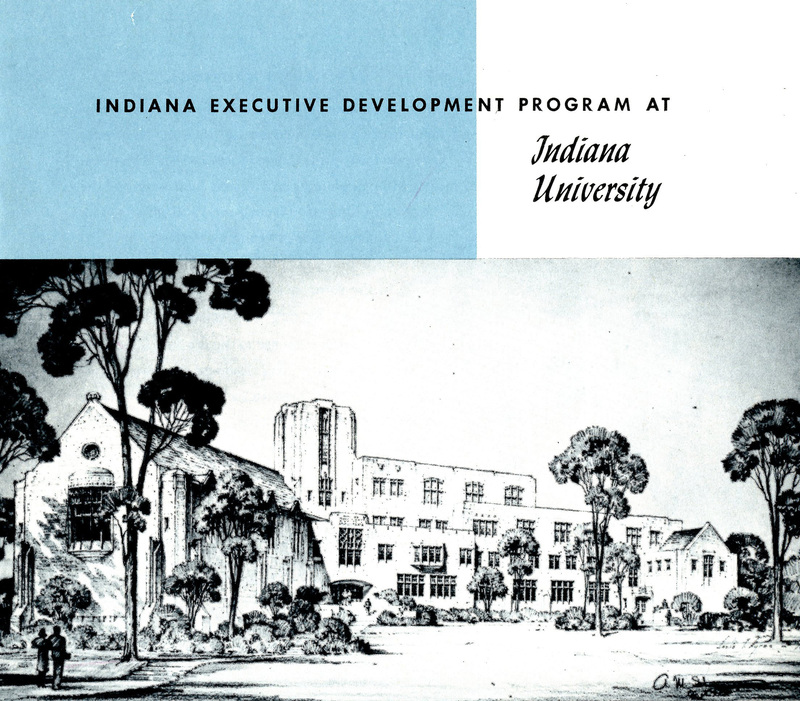 In the summer of 1952, IU’s Graduate School of Business launched an intensive summer program for business executives. For three weeks in June and July over two consecutive years, executives from across Indiana and the nation converged on the Bloomington campus. 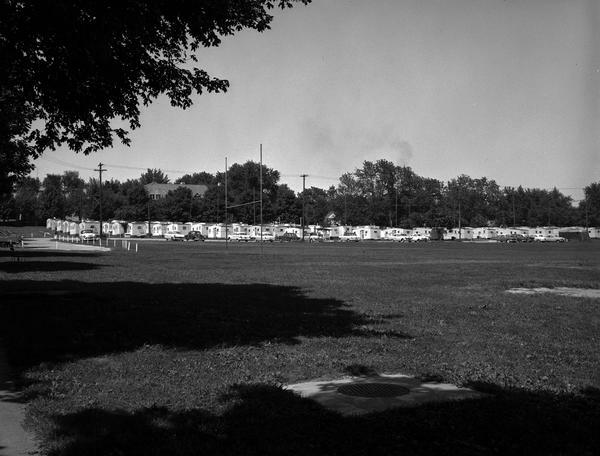 They stayed in rooms at the Union Club, ate their meals together with faculty members in the Memorial Union, and in the evenings they engaged in discussion groups and played tennis or golf. In between those activities, they took classes. A lot of classes. They took classes like Management of Business Finance, Management of Marketing Programs, and Business Cycles and Conditions. They also took classes in literature, music, and fine arts. Designed with the needs of local and national businesses in mind, and often with their input and suggestions, the goal of the Executive Development Program was to prepare executives to take over top management positions in their companies. Praised by Herman B Wells as a pioneering program in adult education, the EDP prepared executives to face the needs of modern business life by developing the whole person, both professionally and personally. To do that, courses were offered in Speech Training for Executives, Music for the Executive, and Current Trends in Literature, in tandem with the classes covering purely business subjects. 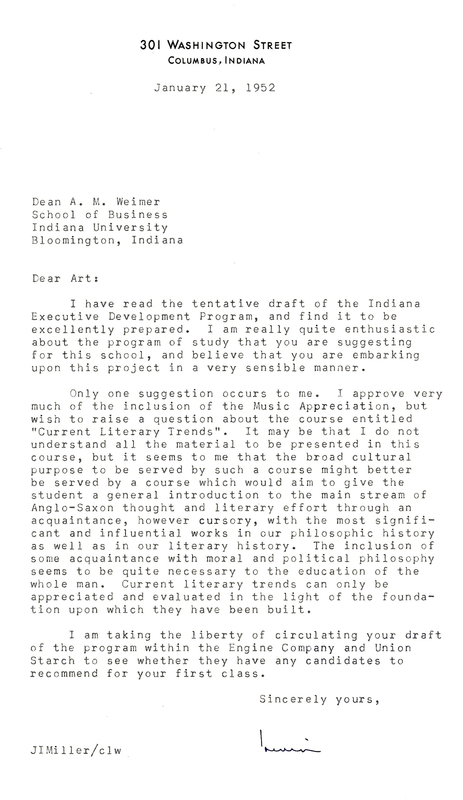 In January 1952, Indiana industrialist and supporter of the arts Irwin Miller sent a letter to Dean of the School of Business Arthur M. Weimer, in which he made specific suggestions about the program’s curriculum. Miller wrote, “I approve very much of the inclusion of the Music Appreciation,” but he wondered if the class in “Current Literary Trends” shouldn’t include works in philosophic history as well as literary history. Miller was sufficiently impressed with the proposed curriculum that he circulated a draft of it within the Cummins Engine Company and the Union Starch and Refining Company to find candidates for the program’s first session. Dean J. W. Ashton taught the Current Trends in Literature class. 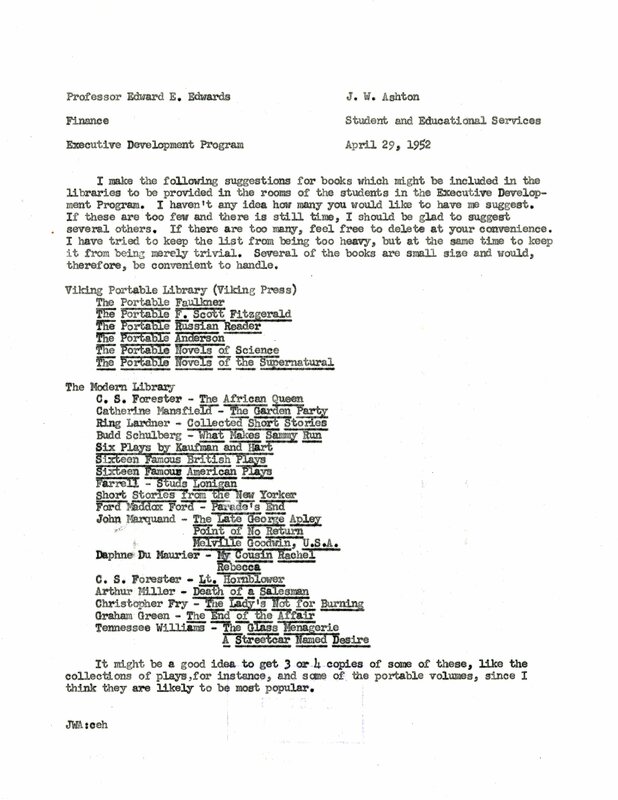 At Dean Weimer’s suggestion that libraries be set up in each room of the Union Club for all executives in the program, Ashton provided a list of suggested books. Ashton’s list includes works by William Faulkner, F. Scott Fitzgerald, Katherine Mansfield, and Daphne Du Maurier, as well as collections of Russian literature, novels of science, novels of the supernatural, and British and American plays. In the 1960s, the program realized the need to include an international dimension. A brochure from 1966 no longer includes literature classes, but it does list courses in Fine Arts and evening Musicale events. It also emphasizes the international dimension. In June 1966, executives could choose between classes in Managerial Accounting, International Operations, or History of Art, Style, and Design. With the institution of GenEd requirements a few years ago, students in the Kelley School of Business often take classes in literature, art, music, and international cultures to fulfill their requirements. But the School of Business has a long history – over sixty years – of encouraging a well-rounded education when it comes to facing the challenges of the modern business world. Posted on November 6, 2017 November 6, 2017 by Author Sara Stefani Posted in Categories From our collections | Tagged: Tags 1950s, Kelley School of Business | Leave a comment on How Do You Succeed in Business? By Taking Classes in Literature, Music, Fine Arts, and International Issues! Margaret Albersmeyer Werling graduated with a bachelor’s in Education in 1953, and, according to her personal scrapbook, attended every sporting event, theater show, and dance that she possibly could between 1951 and 1953. While perusing her scrapbook, I discovered many interesting IU student traditions including: the decorating of fraternities for football games, the Law-Med School Boress, the Arbutus Queen Contest, and the Fall Carnival Parade. Margaret was an avid attendee of athletic events and saved programs from basketball games, track and field events, and football games. She must have truly enjoyed attending the Old Oaken Bucket games between IU and Purdue because she saved tickets and programs from 1951 and 1952. Although she did get to see IU triumph in football, she watched the Hoosiers clinch the 1953 NCAA Basketball Championship over Kansas and attended campus celebrations. I was most intrigued by Margaret’s impressive dance card collection. Dance cards initially became popular in Vienna, Austria in the 19th century and their usage peaked in the early 20th century. Dance cards were typically small, decorated booklets worn on a woman’s wrist or attached to her dress with a cord. Men carried pencils and wrote their names on lines next to the name of dances in the booklet. 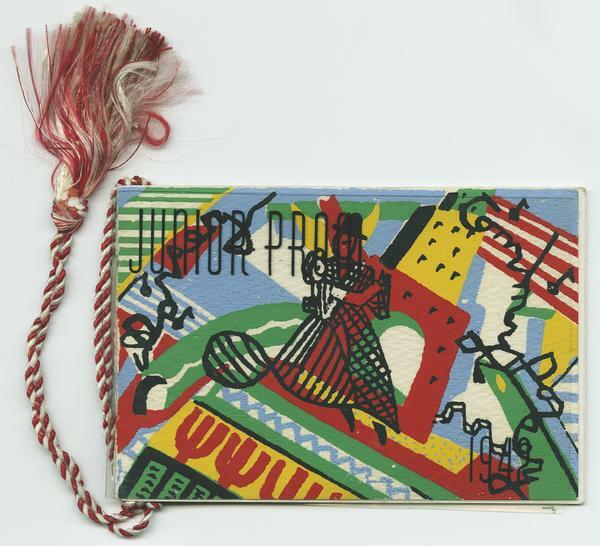 Dance cards remained in fashion until the 1960s when dances became less formal affairs. 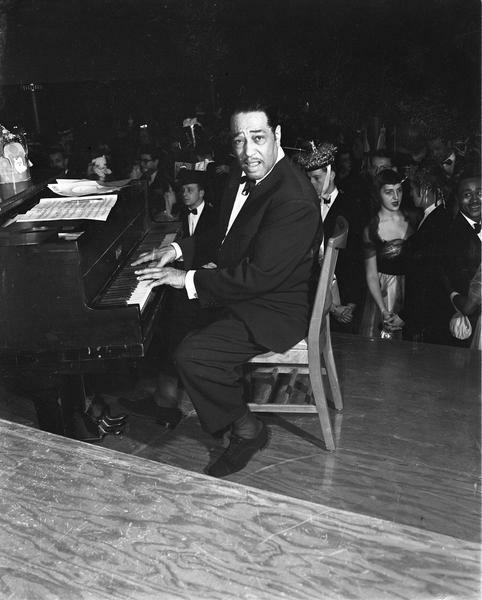 Common phrases such as “pencil me in,” “my dance card is full,” and “save the last dance for me” are all tied to the dance card culture. Many of Margaret’s dance cards have a decorated cover that reflects the theme of the dance, lists of committee members who sponsored the dance, and details about the entertainment. 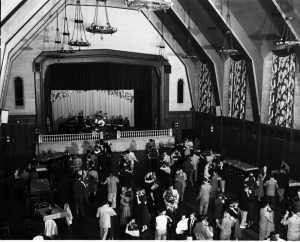 Dances were all the rage at IU in the 1950s. There were plenty of formal and informal dances to keep students busy. Students could attend the Freshman Frolic, the Freshman Tyronian, the Sophomore Cotillion, the Junior Prom, the annual Blanket Hop hosted by Sigma Delta Chi (the honorary journalistic fraternity), the Senior Siwash, and many more! A dance that became an annual tradition on campus was the Wellhouse Waltz. The first iteration of this dance was held in 1944 at the Alumni Hall of the Union. Each year, male attendees selected a freshman woman to become “Miss Campus Coed.” It was said that in order for any IU woman to become a “true coed,” her date must take her to the Well House after the Wellhouse Waltz and then kiss her for the full twelve strokes at midnight. Students voted on a Queen at both formal and informal dances. At the 1952 Sweater Hop, the Sweater Queen was selected out of twenty-nine candidates. 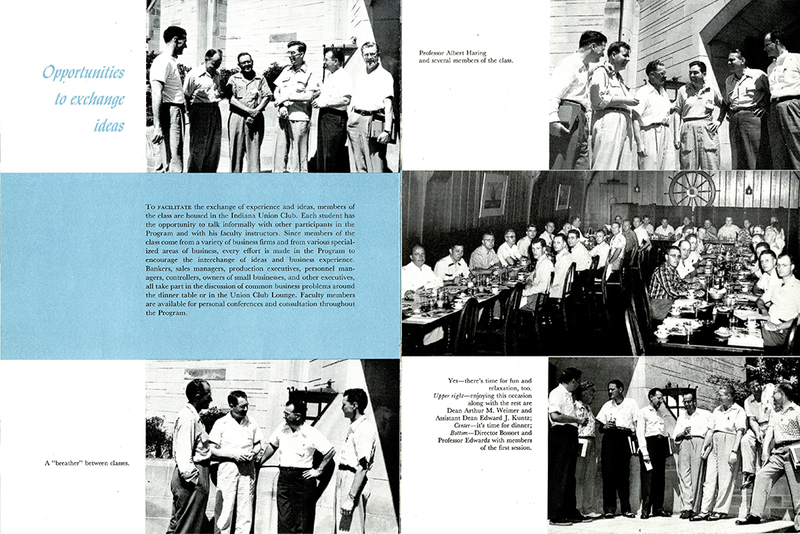 According to the 1953 Arbutus, “each housing unit had the privilege of selecting their candidate for the competition. The list was narrowed down to five girls before the dance by several judges picked from campus dignitaries. The sponsoring housing unit then put on an all-out campus campaign.” Couples attending the dance cast their vote and the winner was presented with a cashmere sweater and roses. Margaret must have loved her time dancing the night away as an undergraduate at Indiana University because she came back to earn a master’s degree in education eight years later. If you would like to learn more about dances at IU, look at Margaret Werling’s scrapbook, or learn about other IU student traditions, contact the IU Archives. Humor has always been a popular approach when discussing collegiate life. It has a way of fearlessly tackling the array of social and academic topics that confront college students like dating, partying, professors, Greek life, and sports. Indiana University has a long history of student-published satire/humor magazines such as the Vagabond of the 1920s, The Bored Walk of the 1930s, and The Date from 1946-1947. Another was the Crimson Bull. 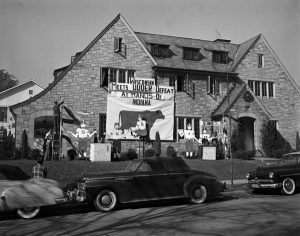 In 1947, the IU chapter of the professional journalism society Sigma Delta Chi launched the Crimson Bull, adopting the name of a former IU student humor publication that was issued in the early 1920s. 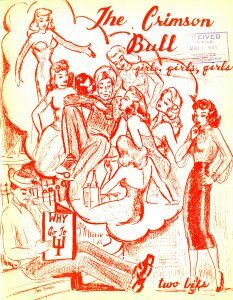 In post-WWII America, the editors of The Crimson Bull found it necessary to stir backlash against the mainstream propaganda distributed by University officials; they courted censorship, played with taboos, and encouraged criticism along with, of course, laughter, providing a unique yet undeniably relatable glance at IU student life. The IU Archives holds over 30 issues from the racy humor magazine dating from 1947-1956. 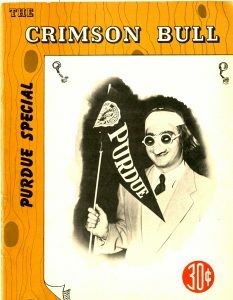 During its publication The Crimson Bull released 6 or 8 issues a year, many of which were special issues ranging from the eminent doom of graduation to “the birds and the bees.” While many of these special issues targeted the typical collegiate themes, the November issues however were often reserved for a distinctly IU problem – Purdue. Out of all of IU’s Big Ten competitors, our greatest rivalry is with our in-state neighbor, Purdue. IU and Purdue have been in-state rivals for over a century, and although bitter opponents, the universities have tried to keep it in good spirits. The two universities have constantly fought over who holds the title of the state school, and the editors of The Crimson Bull were quick to inform readers on IU’s clear superiority. The publication dedicated at least three known issues to berating their northern neighbor university, be it through mock exposés, comic illustrations, or simply flaunting snapshots of IU’s impressively beautiful freshman women. The magazine often refers to Purdue as COW College, stereotyped as the agriculture school that uses its engineering program as a front to disguised its crude, crumbling infrastructure. Purdue is often framed as a true architectural horror with a dismal 6:1 male to female student ratio and embarrassingly subpar literacy standards. These magazine issues include articles set from the perspective of an “undercover” student journalist who bravely ventured to probe the Purdue campus along with interviews from phony “former” Purdue students who had supposedly escaped and transferred to IU, recounting many horrors. The flagrantly false allegations made towards Purdue would have surely gotten a laugh out of any IU student – a scoff and maybe even a chuckle from a Purdue student. 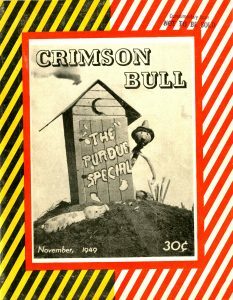 “The Purdue Special” of November 1949 contains a particularly interesting article titled “Our Bucket” that investigates the origin and other historical moments from past Oaken Bucket Games (You can read more about the origins and history of the Old Oaken Bucket in this post from last week.) The competition began in 1925 after the first Oaken Bucket Game ended in a deadlock tie, forcing the trophy to be shared between the two campuses – Purdue having the trophy for the first six months, IU for the latter. As an IU alumnus myself, I especially enjoyed reading about the particularly rattling upset of 1930, where the IU underdogs defeated the Boilermakers at home. 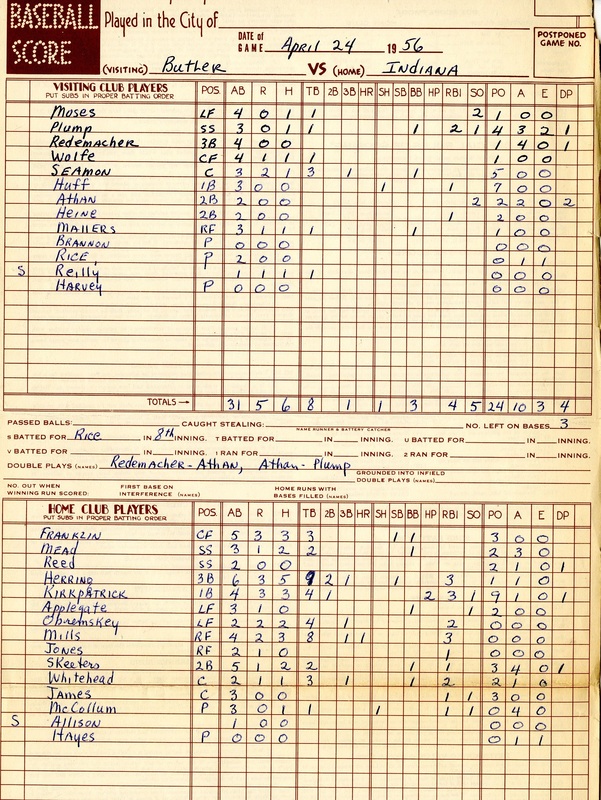 It is rumored that the upset was so unexpected that the officials had only bothered to print a “P” link that year. After returning to Bloomington, accompanied by a band of celebration, the IU football team and fans were stunned to realize that the Old Oaken Bucket trophy had been stolen en route by a band of disgruntled Purdue students disguised in the IU cream and crimson. An investigation pursued for the missing trophy and ten days later the Old Oaken Bucket was discovered unharmed on a loading platform in the middle of Lafayette. The theft caused quite a scandal and further solidified a rivalry that to this day continues to divide Indiana homes. What I enjoy most about The Crimson Bull is that although these magazines were written over sixty-five years ago, as an IU alum, one cannot help but appreciate the long standing tradition of the two universities’ love-hate relationship. 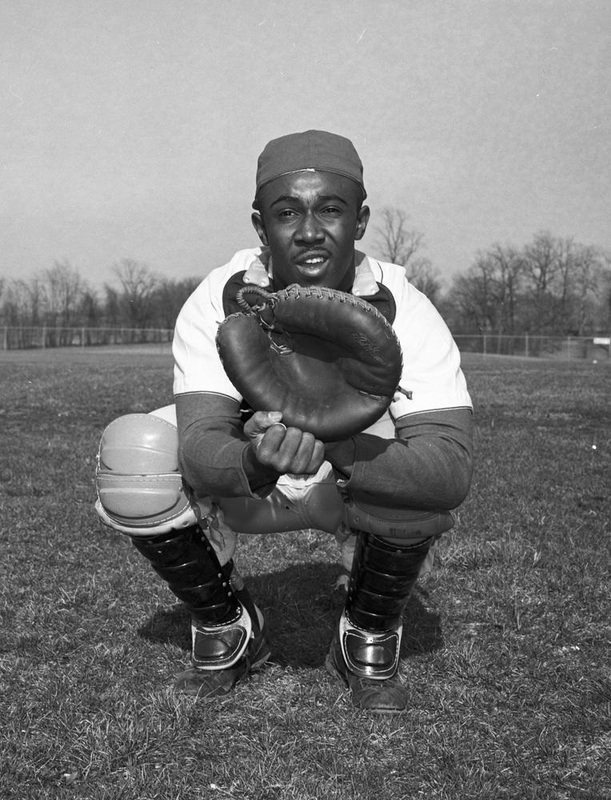 Contact the IU Archives to see the full collection. Like many young couples at IU after World War II, Carolyn and John Fink took advantage of the G.I. Bill and lived at I.U. while earning their degrees. Their life is recorded through Carolyn’s memoir, “Nightingales in the Branches” from 1955 which offers the reader glimpses into the life of married veterans and their wives at Indiana University. Carolyn covers everything from illicit hot plates in the married dorms to saying hello to Nick at Nick’s Olde English Hut. Although Fink’s narrative touches upon the stress and trials of married life in small quarters, it also offers delightful tidbits that make her memoir relevant even to modern readers. 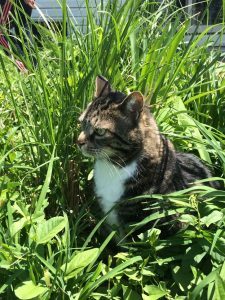 Like many animal-lovers, Carolyn likes to talk about the furry roommates she and her husband acquired during their time living in a trailer near campus. In fact, she dedicates all of Chapter 10 and 11 to their “Cat Era,” which included four cats named Eightball, Fluffy, Charlie, and Orange. She tells of how Eightball only went to the bathroom in ashtrays when they left him inside, and how sickly little Charlie seemed to the rest of them. 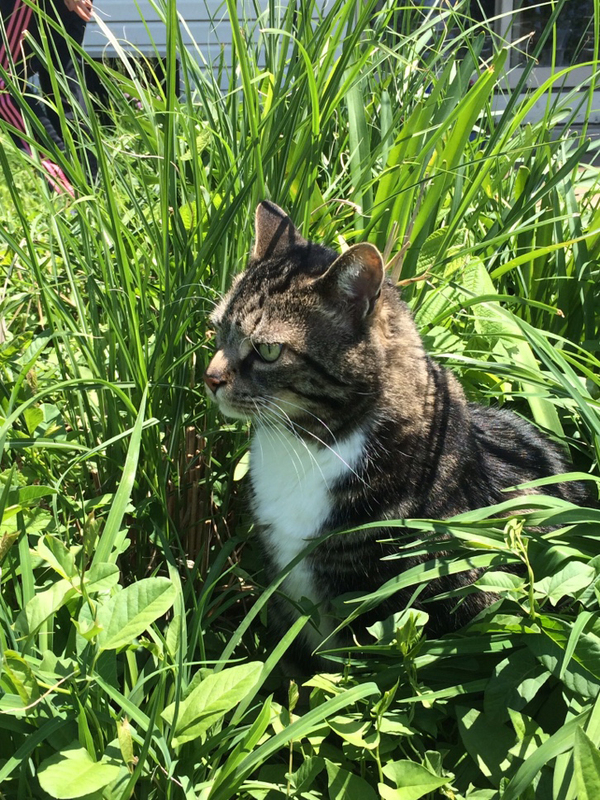 She tells of how they finally discovered that the prissy, feminine Fluffy was actually a tomcat and how Orange seemed to care little about their welfare. While the whole memoir is interesting and made me feel like Carolyn and John’s close personal friend, the “Cat Era” chapter endeared me to them forever. I, too, like to tell everyone about my cat, Daffy, and was thinking “Daffy does that too!” all through the chapter. For instance, like Eightball, he answers all my questions directed at him with a mew and, like Orange, I am pretty sure he could not care less if I almost kill myself trying to avoid stepping on him as long as he is fed. If you are interested in married life at IU, the G.I. bill, or just like to read stories about cats, “Nightingales in the Branches” is an excellent read.